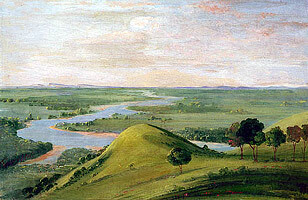 The southern range of the Indian Territory, as painted by George Catlin between 1834-35, two years after the Seminole delegation visited the region. Smithsonian American Art Museum. The delegation made the long journey from Florida, arriving at the proposed lands on the Canadian River, in present-day Oklahoma. The group included six chiefs and Abraham, representing both head chief Micanopy and the Black Seminoles. They found the proposed lands colder than expected. But that was only a minor problem. The real difficulty was that the land lay in Creek Country. President Jackson was following through on his order to incorporate the Seminoles with the Creeks.